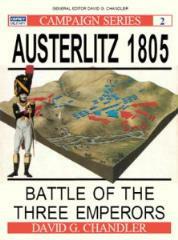 Austerlitz was the battle that established Napoleon's reputation: a classic example of the general's masterly use of deception to lure his enemy into a carefully devised trap. Beginning with the bold and crushing advance of the French Army from the Rhine to the Danube, David Chandler describes the envelopment of Mack's army at Ulm, the maneuvers to Austerlitz and the counter-attack that resulted in the decisive defeat for the Austro-Russian Army. Excellent overview illustrations of the battlefield at Austerlitz supplement the text by clearly showing the movements of the opposing armies. A comprehensive guide to one of the most important battles of the Napoleonic Wars.